To what limits would you be able to push yourself to provide for your family? This is a question tackled by several highly successful movies and television shows in recent years, but the Netflix original show “Ozark” puts this concept on its head. It follows a Chicago financial planner, Marty Byrde (Jason Bateman), who is already deep in the throes of illegal money laundering schemes with the Mexican cartel and when the behind-the-scenes operation is rendered kaput by a leak to the police, he has to make a choice that will cost his family. After his long-term business partner is revealed to have been stealing money from the Mexican cartel for years and is having Byrde launder it, the merciless and demeaning crime lord Camino Del Rio (Esai Morales), who is also the victim of this theft, shoots every constituent in the operation. When it is Byrde’s turn on trial, he is forced to use anything he can to plead with the crime lord and spare his life. With a gun to his head, he proposes to take his skills in cleaning money to a large reservoir that is also a popular tourist attraction in the Lake of the Ozarks in Missouri. There, he sets up an even more profitable operation, taking advantage of the population booms generated around that area during the summertime for the next five years. He looks to money laundering as a means to take control of his own life, seeing it as a measure of his own choices and how far he will go to ensure that he has a fulfilling life despite his useless job and secretly watch the tap of his wife cheating — usually as she sits next to him, not noticing. This may come across as a snotty excuse to partake in criminal activities, but through the next nine episodes of the first season, we see this choice proving to be more fruitful to the Byrde family than imagined, bringing them closer together. Marty and his wife Wendy (Laura Linney) begin to rely on each other in more important ways in the midst of their Del Rio-scrutinized stay in the Lake of the Ozarks, blending into their new environment and Marty proving his worth at the front-end of his master plan are essential elements to their survival. The show does deserve its merit when it comes to creating a rich storytelling environment with interesting lead characters, which Bateman and Linney make natural and audacious, but you will begin to notice further along the show’s first season that there is also considerable stagnation in their actions to help serve for more surprising and gruesome moments in the show. 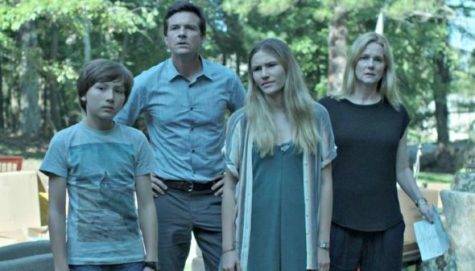 There are some obvious pulls from other hit shows with the same subject matter, and this serves “Ozark” with some classic TV tropes involving side plots about FBI investigations, having to keep secrets from each other and their kids to ensure safety, etc. But this doesn’t draw from the potential that the first season has created for future seasons to prosper with the further inclusion of two other criminal families that Marty has come across upon his move to the Ozarks. The show has been nominated for four Primetime Emmy awards for directing, cinematography and acting. Bateman directed the first two and the last two episodes of the first season and the finale garnered him a nomination. The creators of the show, Bill Dubuque and Mark Williams, have worked on the screenplay for the 2016 movie, “The Accountant” starring Ben Affleck, Anna Kendrick and Jon Bernthal. This is the first show they’ve created on Netflix, which seems to reach the perfect audience. If you haven’t watched the show yet, it is a good, albeit sometimes quite generic show. The crime drama has thrilling aspects and a storyline in the vein of “Breaking Bad.” The first two seasons are available on Netflix, with the third season already confirmed.